So, my Super Bowl Sunday started off with running in my 4th half marathon. If you read my blog on Friday, you should know the reasons why this half marathon was a different experience for me before the race started. I had no clue how to train when having 3 weeks between a full marathon and a half marathon and I had been unable to run outside during race week. So, I had no clue what to expect out of my body on this race. It was one race where I just had to take every mile as it came. If it needed to be my slowest half marathon, then that’s what it would be. 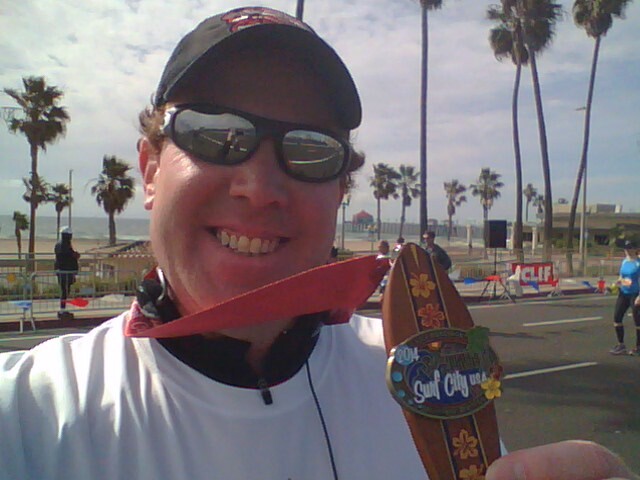 Either way, my main goal was to finish, get the cool surf board finishers medal, and complete the first of three races in the Beach Cities Challenge. So, the recommendation of the race organizers was to plan on arriving 1 1/2 hours before your race was scheduled to begin because of traffic. The full marathon started at 6:30am and the half marathon started at 7:45am. So, I decided to wake up at 4am (hey, at least it wasn’t 3am like the races at Walt Disney World!) and got out the door at 4:40am. 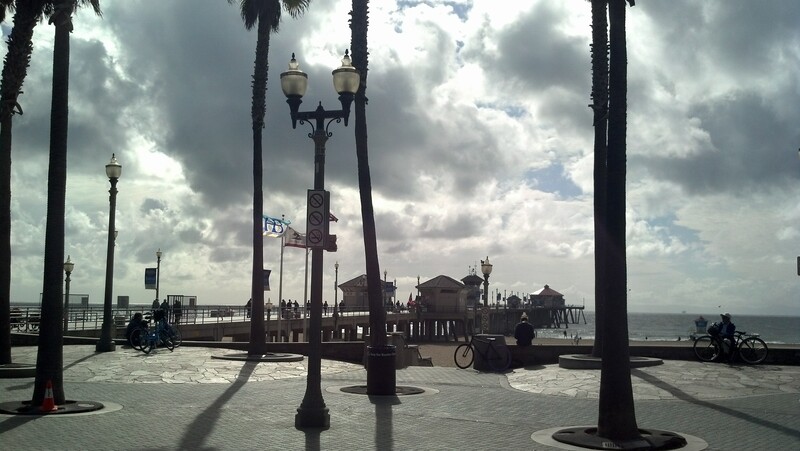 The drive to Huntington Beach is a little more than an hour away without traffic. I made fantastic time driving. The organizers warned of bad traffic on Beach Blvd. So, I was cautious as I drove down Beach Blvd. towards Pacific Coast Highway (PCH). The drive was going really well until I got to the spot where only 2 traffic lights remained. Then…the above happened. Standstill traffic. 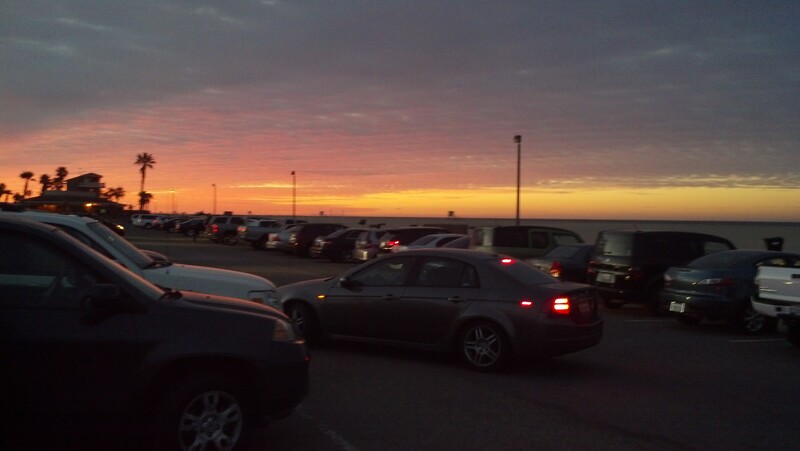 I arrived at that point at 5:20am and didn’t get parked until around 6am. So, the final mile or so of driving took me almost as long as the drive from Pasadena to that point. Crazy! 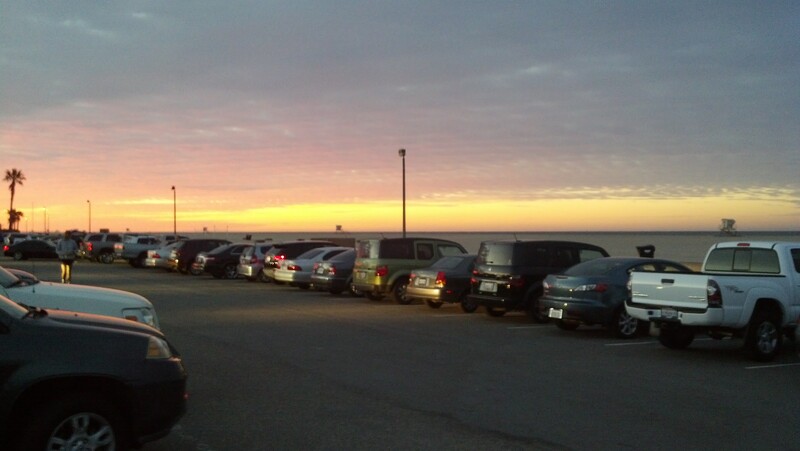 While I had started to stress a little bit before we got to the parking lot, this view calmed me down immediately. 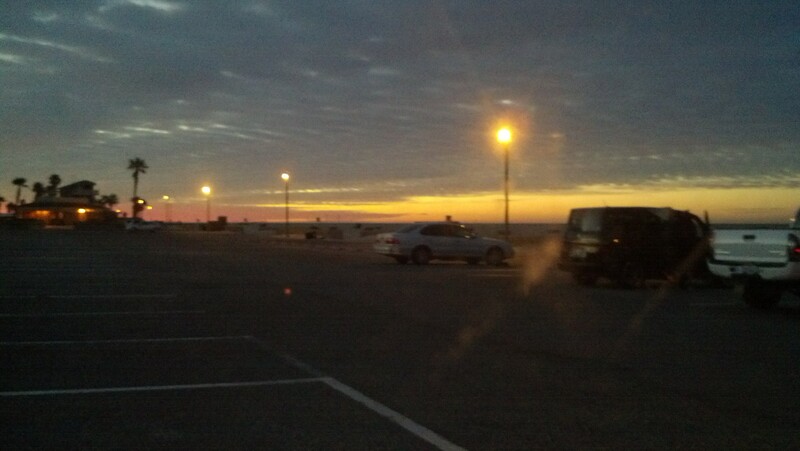 Sunrise at the beach. Could a Super Bowl Sunday start in any better way? Seriously, wouldn’t you like to wake up to this every single day? Did I mention how much I love running at the beach? It was freezing outside. Well, freezing for a Southern Californian. You know, temps in the high 40’s or low 50’s (I didn’t actually check, but that was the forecast). I quickly got ready and was on my way to the start line. I probably should have brought a bag to check so I could have kept my jacket on longer. It was so cold to me that my teeth were chattering for a few minutes. Then, thanks to some brilliant advice I saw online, I got out “hot hands” that was purchased at Target for about a dollar for the Walt Disney World Marathon Weekend, but never used. They are just small bag things that get warm. Once they did, I was fine with the temps. It’s amazing how holding something that is warm can warm up your whole body. One of the many awesome things about this race? The tent that housed the expo on Friday and Saturday was still up on Sunday morning. That gave us runners a somewhat warmer place to wait. LOVED THIS! Not only did it give us a warmer place to wait for the start, but a somewhat padded carpet on which to sit and stretch before the race. 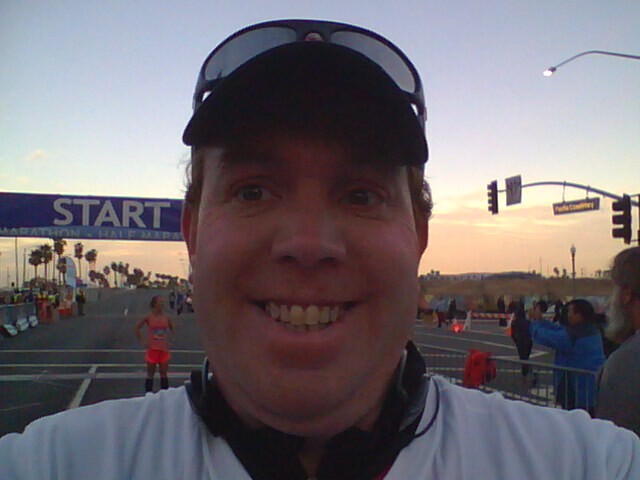 With all the marathon corrals on the road, I took advantage of the open starting chute. I was not alone. Along the road next to the starting chute, were tents like these for the various running groups that had people participating in the race. The closest one to me in the picture is the Pasadena Pacers. I’ve got to get out and run with them sometime soon. 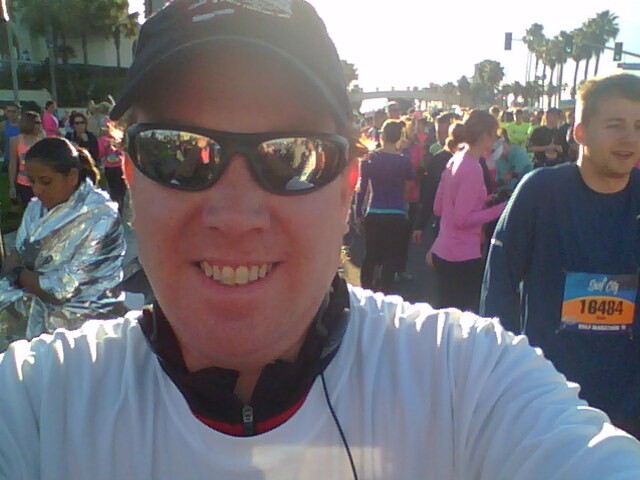 With around 15 minutes until the start of the first corral in the Surf City Half Marathon, I got into my corral. In the runDisney races, the corrals are marked with a letter. 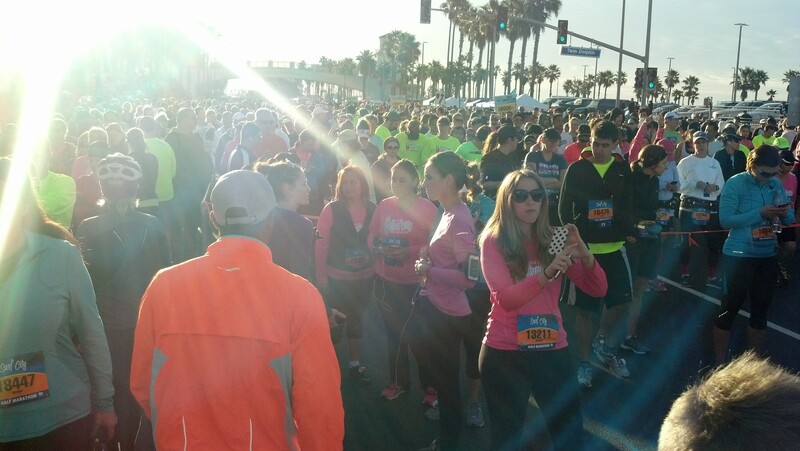 In the Rock n Roll half marathons, they are marked with a number. 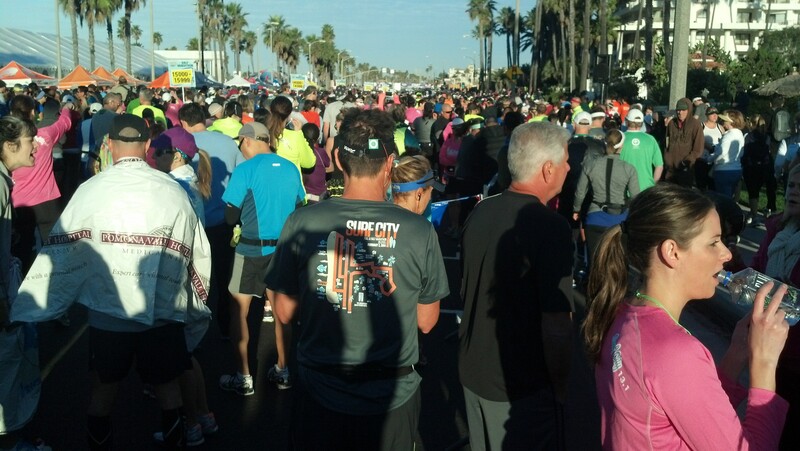 In the Surf City Half Marathon, each corral contained around 1,000 people. They had the corresponding numbers on the side and you’d line up in between the banner where your number fell and the one behind it. As you can see, there were a lot of people out for the start of this race. I believe that between the half marathon and the full marathon there were over 22,000 runners. As you can see, I wasn’t in the last corral. There were quite a few people behind me. Unlike my previous half marathons, there wasn’t a hard time limit for the half marathon. The race course was open until 1:30pm. With the half marathon launching their first group at 7:45am, that gave us more than enough time to finish the course. As I was unsure of how my body would respond in this situation, it was a relief to know that I didn’t necessarily need to maintain a 16 minute per mile pace or be swept off the course. Still waiting in my corral. Here’s the thing that I did not enjoy about this race. They put out a schedule of when each corral was going to start. My corral was supposed to start at 8:07am. At 8:25am, we still had not moved at all. On a day where the weather was warmer, this might have caused me more concern. However, I wish that the organizers had either refrained from posting the start time for each corral, like a lot of other races do, or that they had stayed on schedule (or at least close to it). I believe my corral started at a little after 8:30am. When I saw that there were going to be 1,000 other people starting at the same time as me, I was concerned that it might be crowded at the beginning. Well, that concern was quickly swept away once we crossed the starting line. Most of the race is on PCH. 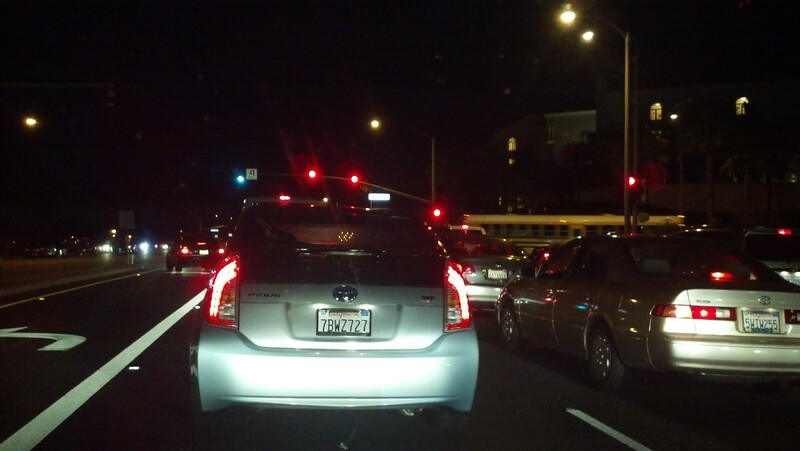 I think there were three or four lanes going each way. All of that was open to us runners. It was a heavenly start to the race. I got off to a 10:45 first mile. That’s my usual training pace in the first mile. It felt great to be out and running by the beach. I was running well and the second mile marker came up…a 10:50 second mile! I’ve not been this fast over the first 2 miles since my 5K PR race in Pasadena. I wasn’t too concerned by going out too fast at this point because I didn’t feel like I was pushing particularly hard. I was running 1 minute, walking 1 minute and kept repeating. A couple of my run intervals ran longer than a minute. The funny thing about the first couple miles is that the Marathon Photo people always seemed to be at places where I was on a walk break. 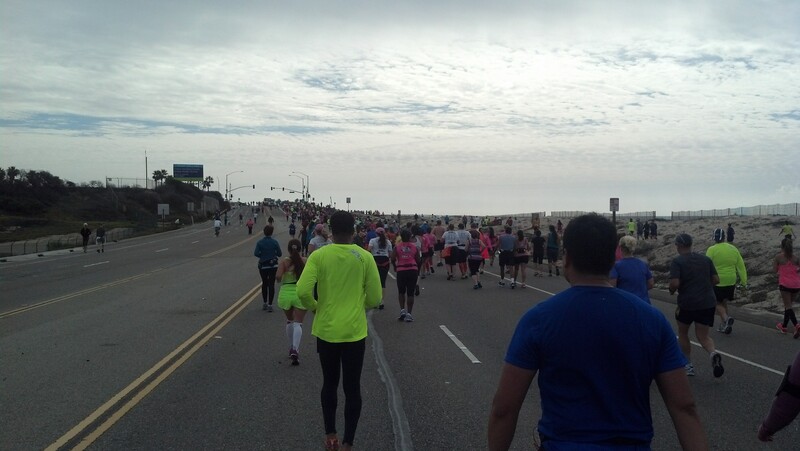 We turned off PCH towards the end of the third mile. I was still under an 11 minute per mile average pace! The best part was that I felt AMAZING while doing this. My running playlist was on random mode unintentionally. So, it was interesting to see how the songs came up. I was grooving to a great playlist in a different order. Life felt AMAZING! The fourth mile brought some rolling hills. The few hills we faces on this mostly flat course were small to me. As a matter of fact, the first hill came right at the start of a run interval. As I started that interval, I just thought…only 1 minute, you can do this. Sure enough, I did. By the end of the 1 minute interval I had almost crested the top of the hill. That’s how small the hills on this course were! By the end of the fourth mile, I was a little over the 11 minute per mile average. That was completely okay with me. The fourth mile had small hills in it and I was aiming to finish 5 miles in an hour or less. In the fifth mile, I stayed right on the average I had at the end of the fourth mile. 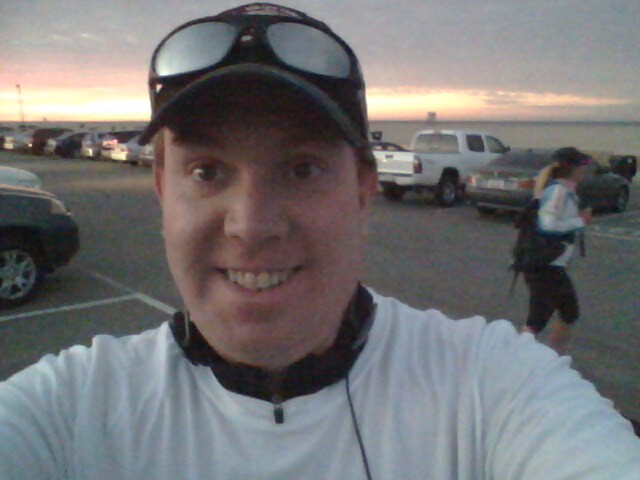 I finished the first five miles in around 56 minutes! 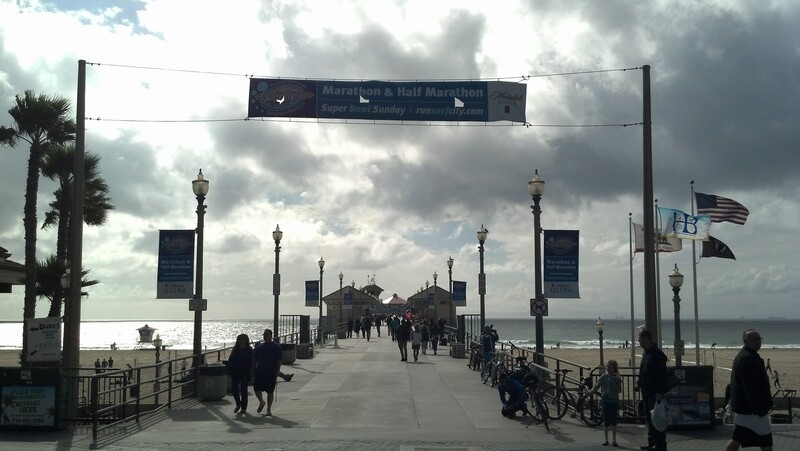 The sixth mile took us back to PCH, where we would be for the rest of the race. Thanks to the You Tube video I highlighted on Friday, I knew all of this was coming. As a matter of fact, that video really helped me out mentally. I knew where the turns were coming and where the little hills were coming. I also knew that once we got back on PCH, we’d be there until the end. By the sixth mile, the water stops started coming in the middle of run intervals. So, I had a bit of a change in strategy. If I came to the water stop towards the end of a run interval, I just got my cup of water and kept going until the end of the interval and then drank. If it came in the first 30 seconds, I would stop running, walk while drinking, and then make up the difference on the other side. That meant I had some run intervals that lasted 1.5 minutes and shorter walk breaks. The sixth mile was a little slower for me as I crossed by the banner at 1 hour 8 minutes and change. However, I still felt good and was on the faster side of my training runs! I have no idea where the 7th mile officially ended. One of the downsides of running at the beach is the wind. I think the wind may have knocked down the 7 mile marker. I did come across the 11 mile marker for the marathon and made a guess that was somewhere close to where the 7 mile marker should have been. Towards the end of the 8th mile, as I was on pace for a new half marathon PR, I got a slight cramp or twinge in my calf. 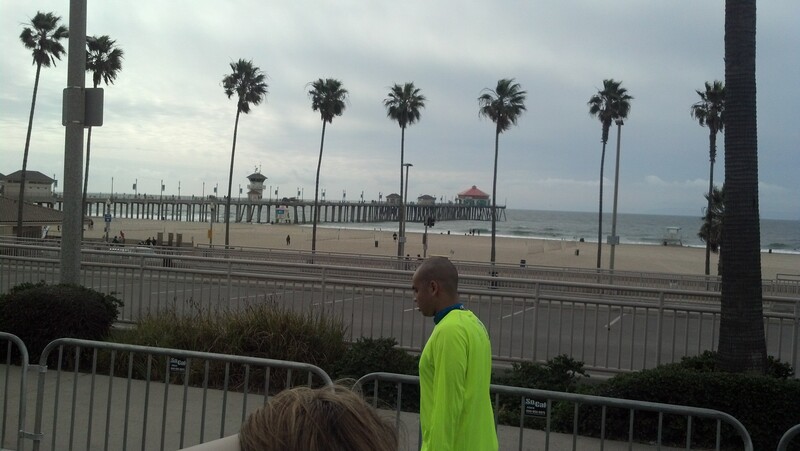 The last time I ran in Huntington Beach was my 20 mile training run. You can read about that experience here. On that run, I had this happen towards the end of the 10th mile. Unlike that experience, I was able to continue with the run intervals. At least for a little while. By the end of 8 miles, I was concerned with this twinge, but happy with my time. Going into this race, I secretly hoped to finish in 2 hours, 40 minutes. At the end of 8 miles, I thought I might beat that goal! In the ninth mile, this twinge became something I could no longer ignore and try to run through. It was happening in every run interval I attempted and usually in the first 15-20 seconds. That’s when my dream of a Super Sunday half marathon PR ended. Sad times for sure. It’s amazing how a great race can turn into something less than great so fast. One mile before I made this decision, I was feeling on top of the world. There were moments in the first 8 miles where I seriously felt like I was flying. The temps were cool, the wind was at my back pushing me forward on this mostly flat course. All of my worries over not running on race week and having such a short turnaround between races were erased in those first 8 miles. Then, it all went away in less than a mile. By the end of the ninth mile, I knew I needed to walk the rest of the way. 4.1 miles of walking. It was time to just let that half marathon PR idea go for this day so I could fight another day. As I was feeling bummed about seeing my Super Sunday slip away, I looked around me and decided to just enjoy my 4 mile walk to the finish. I was at the beach after all! The Pacific Ocean looked amazing! How could I let this failed PR attempt keep me down? I realized in the tenth mile that I had already done better than I would have guessed. So, it was time to refocus and see how much time I could salvage. How fast was I going before all of this? Well, even with walking the entire 10th mile, I crossed that mile marker at 2 hours 1 minute. I was only 1 minute slower than I wanted for this PR attempt. I was also right on track with my Rock n Roll Los Angeles Half Marathon PR. The difference is that this course was flat. I did try running a little in the 11th mile with the same results as I had in the 10th mile. By walking, I now had time to take a few pictures. If things didn’t go so well at the start, I could have taken more. However, now that I was walking, I got the phone out and was ready to snap a few pictures. 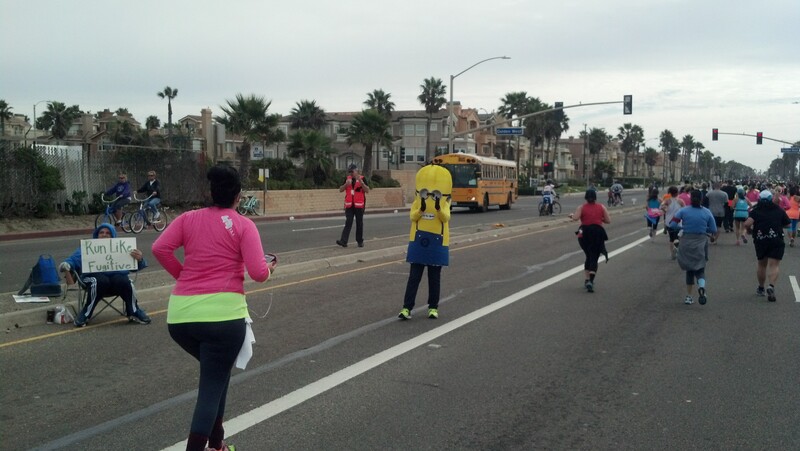 We had a minion on the side to encourage us! I love minions! By the time we got back to the pier, I knew the finish was oh so close. When you do a lot of walking, you get the chance to try to calculate how long it might be. I really wanted to finish in 2 hours 50 minutes. That way, I only gave up 7 minutes from my half marathon PR and would consider it a small, minor victory. 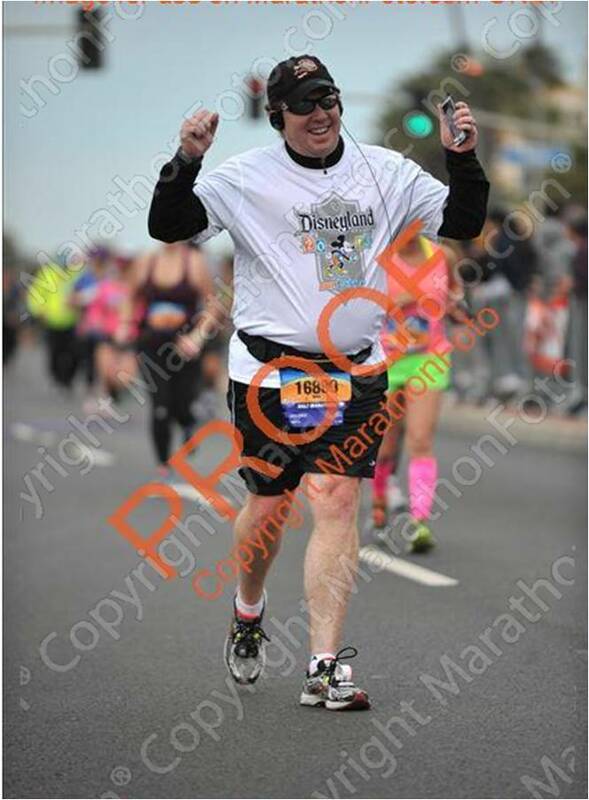 At the very least, I wanted to beat my Disneyland Half Marathon finish time of 3 hours even. 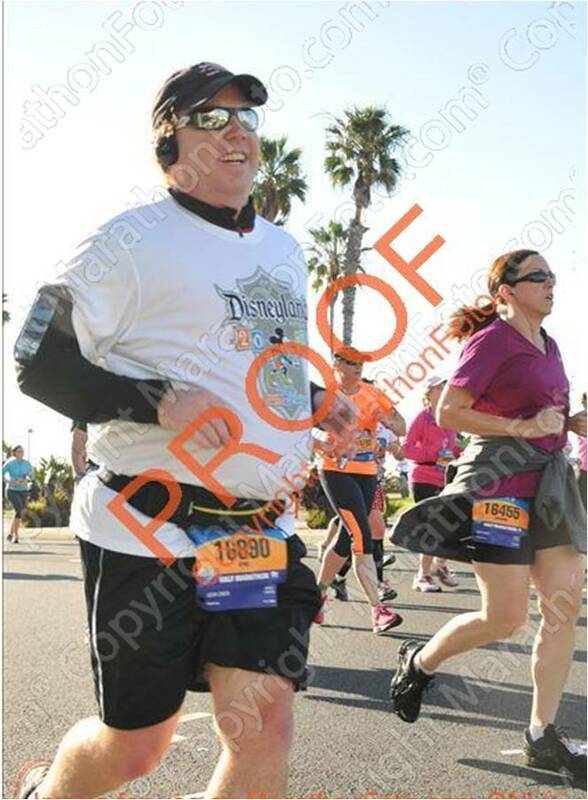 By the time I got to the Huntington Beach Pier, I knew I would beat the Disneyland Half Marathon time and that this was going to be my 2nd fastest half marathon! When I saw the 26 mile marker (for the marathoners) coming up, I looked at my time and felt like my only shot at making the 2 hour 50 minute goal was to run a little. So, I tried running and was able to run for a little longer than a minute. That took me past the 26 mile banner. I was fine. No twinges at all. As a side note, I wonder if I need to have some pretzels with me in the future. A lady in the 13th mile had pretzels for us and I ate a few. Anyways, after that test of running proved to be succesful, I looked at my watch again. I needed to go if I wanted to make my secondary goal. So, before I got to the 13 mile marker (for the half marathoners), I took off and kept running until I crossed the finish line. There was a little room between me and those around me in the final stretch. That gave one our favorite runDisney announcers Rudy Novotny the opportunity to welcome me to the finish line. Hearing my name (a first in any race I’ve ever done) pumped me up. It prompted this picture. I crossed the finish line in 2 hours, 49 minutes, 30 seconds! I was 30 seconds ahead of my secondary goal! 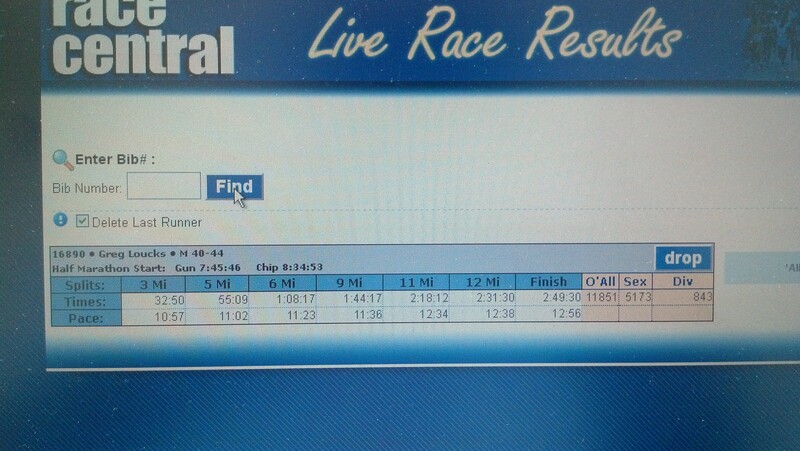 Also, it was my second fastest half marathon! 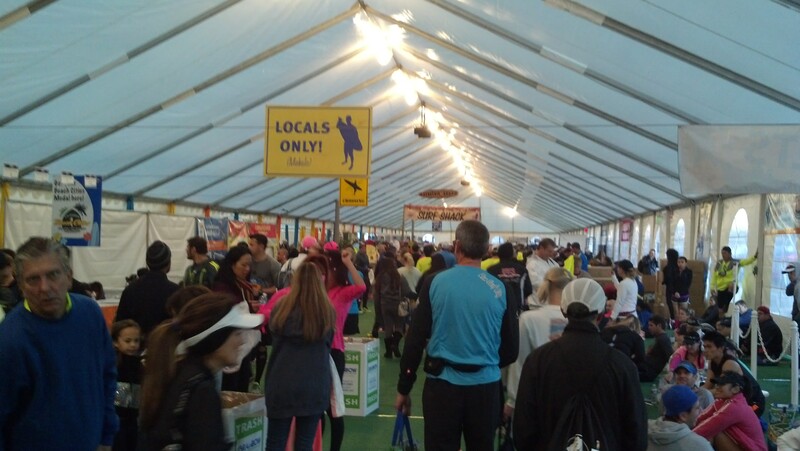 I headed back to the expo tent to look up my official time. Oh, I forgot to mention. When I got in line for my official finishers photo, I saw Erica, the girl who paced me through the first 19 miles of the Walt Disney World Marathon! 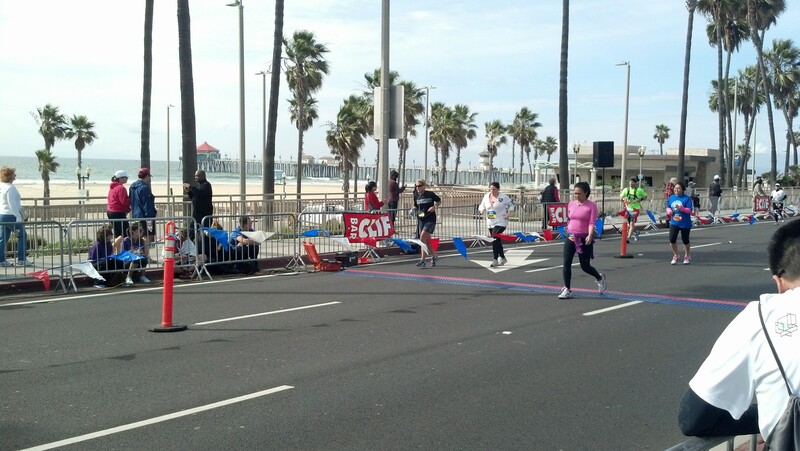 She was pacing another person to a 2 hour, 45 minute half marathon finish. It was great to see her again! Anyways, while I was in line waiting to see the official results, I met a cool guy whose been running these long distances for a while. Talking with him was exactly what I needed. I told him how this was my second fastest half marathon and how disappointed I was with walking most of the last 4 miles. He told me that he’d done so many races that PR’s no longer mattered to him. Plus, he said that, at his age, he probably wouldn’t come close to the PR’s he already had because they were set around 20 years ago when he was much younger. Perspective. He loves running the races and that’s all that mattered to him. After getting my finish time, I wandered back towards the race course on my way to lunch. 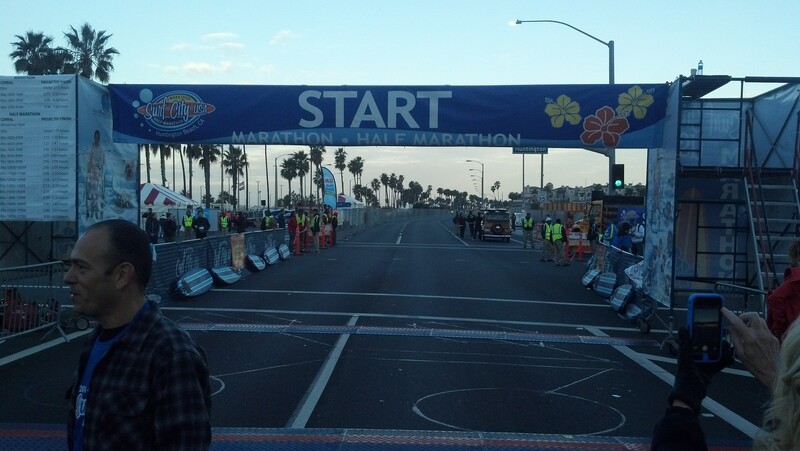 Here’s what the finish line looked like. 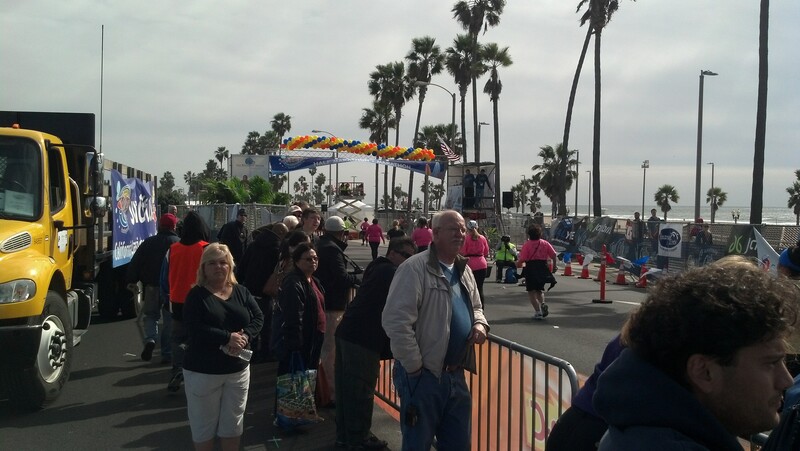 As you can see, the marathoners finished on one side and the half marathoners on the other side right next to them. I was one happy half marathon finisher! When you run at the beach, you’ve got to get a picture of yourself with the medal and the beach in the background. Right? 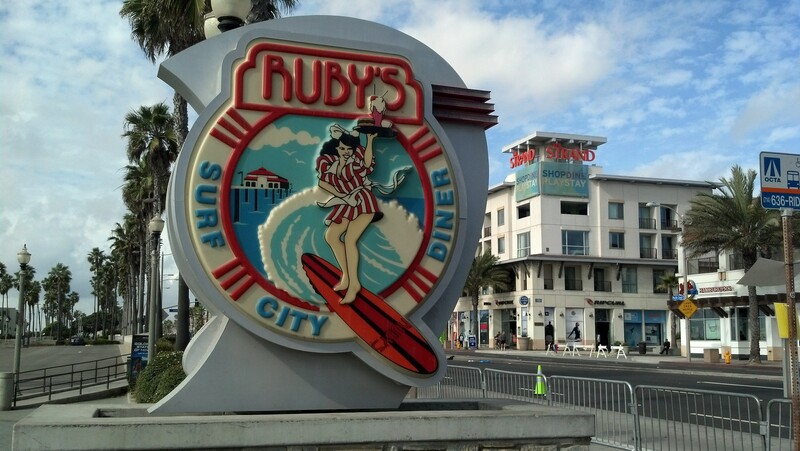 I really wanted to eat lunch at Ruby’s again. However, when I walked by initially, it looked like you couldn’t get there. So, I settled with going to BJ’s for lunch. I caught this picture on the way back. The clouds made for some amazing views as I walked the long journey back to my car. As if finishing 13.1 miles were not enough, I still had more than another mile to go before I would reach my car. I tried not to think about how long I had to walk and just took in the amazing beach views. 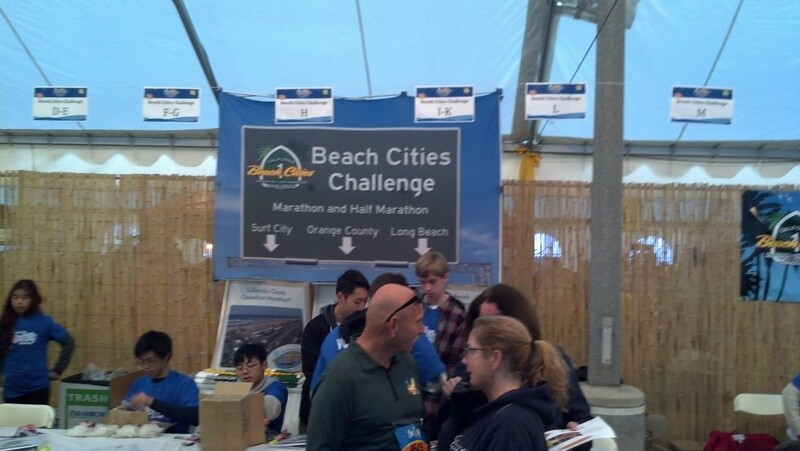 Race 1 of the 3 required for the Beach Cities Challenge is in the books. Overall, I LOVED this race and can see myself making this race a Super Bowl Sunday tradition! The course is very flat and super fast. You get to run by the beach for almost the entire way! 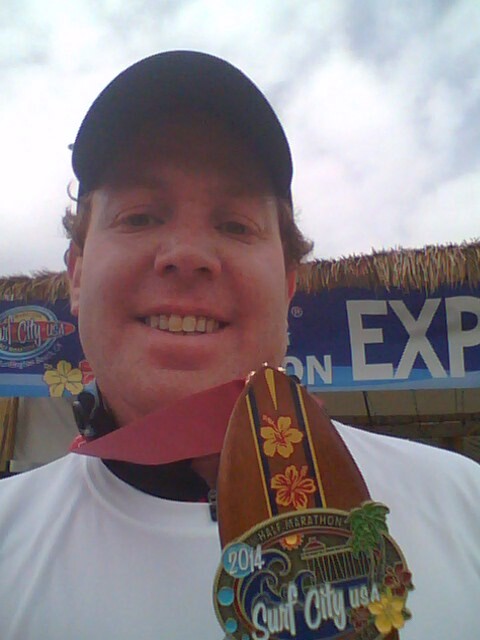 The surf board finishers medal is very cool! Because you’re by the beach, there is a nice cool breeze. What’s not to love? I honestly would say the Surf City Half Marathon is an ideal half marathon course that everyone should race at least once. It’s perfect for setting a PR. It’s also perfect for a newbie who wants to try out the half marathon distance. If only there were Disney characters on the course, it would be hands down my favorite race! I will be back next year. Afer all, I know that I can do better next time. OGM. i’m in your picture! 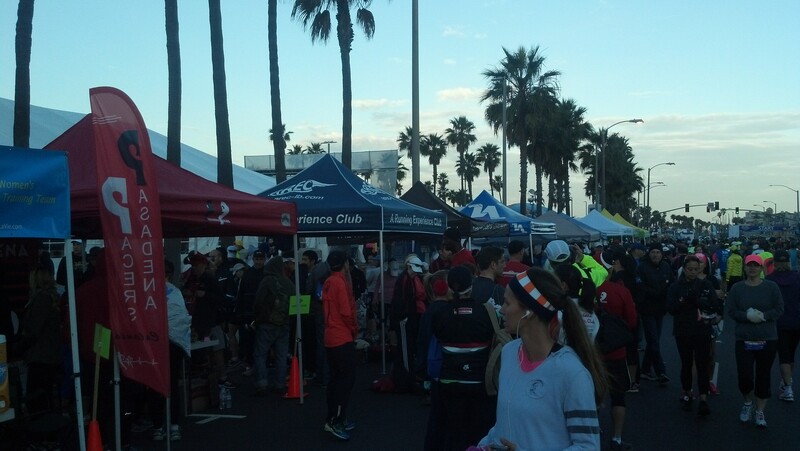 I ran with Pasadena Triathlon Club. We mooched tent space with the pasadena pacers. i’m in the background of the Pacer tent picture, far left, i’m wearing a blacksweat shirt and a white visor!!! sorry about your mile 9. i’ve been there too. you’ll get ’em next time. finishing is what matters. and the medal too. btw, i posted by race report on my blog. Thanks for the encoragement Joe! I will do better next time. My next half will be the Hollywood Half Marathon. I’ve got two months and will be ready. 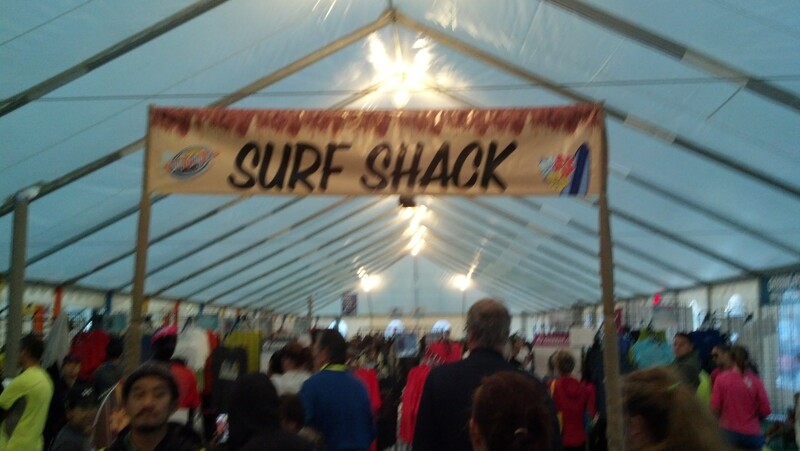 I’m also planning on a redemption run at Surf City next year. Love that course and the medal! Too funny that you’re in one of my pics!